What are some early warning signs of a bite problem? Why do baby teeth sometimes need to be pulled? What about the wisdom teeth (third molars), should they be removed? How long will I have to undergo orthodontic treatment? Will I still be able to play sports? A: Orthodontics is a specialty branch of dentistry that deals with the diagnosis, prevention and treatment of dental and facial irregularities. Braces are appliances normally used to correct these problems. Q: Why is orthodontics important? 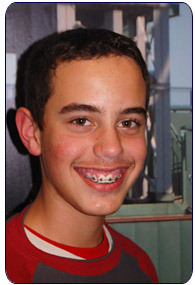 A: An attractive smile and improved self-image is just one of the benefits of orthodontic treatment. Without treatment, orthodontic problems can lead to tooth decay, gum disease, bone destruction, chewing and digestive difficulties, speech impairments, tooth loss and other dental injuries. A: Having straight teeth that fit together properly improves function and your teeth and jaw joints can work more effectively. Straight teeth make it easier for you and your dental team to keep them clean. If you ever need a filling, crown or bridge, your dentist can usually do better restoration if the teeth are aligned properly. The appearance of teeth and face is improved. Having a pleasing smile improves self-esteem, confidence and a feeling of acceptance in our daily activities. 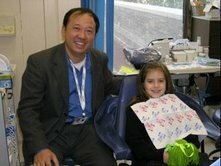 Q: At what age should orthodontic treatment occur? 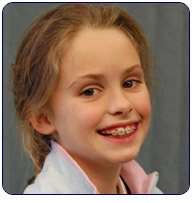 A: Orthodontic treatment can be started at any age. Many orthodontic problems are easier to correct if detected at an early age before jaw growth has slowed. Early treatment may mean that a patient can avoid surgery and more serious complications. The American Association of Orthodontists recommends that every child first visit an orthodontist by age 7 or earlier if a problem is detected by parents, the family dentist or the child's physician. A: Malocclusion literally means bad bite. Most malocclusions are inherited, however, it is possible to acquire a bad bite from habits such as tongue thrusting and thumb sucking. The premature loss of baby teeth or the extraction of adult teeth can also cause the development of malocclusion. Q: What are some early warning signs of a bite problem? A: Early or late loss of primary teeth, Difficulty in chewing or biting, Mouth breathing, Finger sucking or other oral habits beyond age 5, Overlapped, misplaced or blocked-out teeth, Protruding teeth, Biting the cheek or into the roof of the mouth, Teeth that meet in an abnormal manner or do not meet at all, Jaws that shift or make sounds, Jaws that protrude, retrude or contribute to facial imbalance, Speech difficulty. A: Most patients experience some discomfort the first week after their braces are put on and immediately after their braces are tightened. Aspirin, non-aspirin pain reliever or ibuprofen can be used to ease the discomfort. Q: What can I eat with braces? A: Most foods can be enjoyed just as before you got your braces. Hard, crunchy and sticky foods can damage braces and should be avoided. Q: Why do baby teeth sometimes need to be pulled? A: Pulling baby teeth may be necessary to allow severely crowded permanent teeth to come in at a normal time in a normal location. If the teeth are severely crowded, some permanent teeth will either remain impacted (teeth that should have come in, but have not), or come in to an undesirable position. To allow severely crowded teeth to move on their own into much more desirable positions, sequential removal of baby teeth and permanent teeth (usually first premolars) can dramatically improve a severe crowding problem. This sequential extraction of teeth, called serial extraction, is typically followed by comprehensive orthodontic treatment after tooth eruption has improved as much as it can on its own. Q: What about the wisdom teeth (third molars), should they be removed? A: In about three out of four cases where teeth have not been removed during orthodontic treatment, there are good reasons to have the wisdom teeth removed, usually when a person reaches his or her mid- to late- teen years. Your orthodontist, in consultation with your family dentist, can determine what is right for you. Q: How long will I have to undergo orthodontic treatment? A: It will vary for each patient and always depends on how much your jaw needs to change and how far your teeth must move. Q: Will I still be able to play sports? A: Yes. It is recommended, however, that patients protect their smiles by wearing a mouth guard when participating in any sporting activity. Mouth guards are inexpensive, comfortable, and come in a variety of colors and patterns. Q: Will braces interfere with playing musical instruments? A: No. However, there may be an initial period of adjustment. In addition, brace covers can be provided to prevent discomfort. Q: Can you be too old for braces? A: No. Age is not a factor; however, there are advantages to treating young people while they are still growing. About 25% of orthodontic patients in the United States are adults. If you are an adult considering orthodontic work, that treatment has changed a great deal in the last few years. Braces are more comfortable and more effective today. You can get braces in the tradition silver color, or with much less visible clear brackets. Q: Why are retainers needed after orthodontic treatment? A: After braces are removed, teeth can shift out of position if they are not stabilized. Retainers provide that stabilization and are designed to hold teeth in their corrected, ideal positions until the bones and gums adapt to the treatment changes. Wearing retainers exactly as instructed is the best insurance that the treatment improvements last for a lifetime. Q: Is orthodontic care expensive? A: Orthodontic fees have not increased as fast as many other consumer products. When orthodontic treatment is implemented at the proper time, treatment is often less costly than the dental care required to treat the more serious problems that can develop years later. After examining you or your child, we will review the costs involved with treatment. Financing is usually available and our office offers customized-flexible payment programs that will meet your needs. In addition, many insurance plans now include orthodontics. Q: How often will I need office visits? A: Once appliances are in place, routine office visits are at six to eight week intervals. Periodically, we may need to see you sooner or in case of any emergency we will probably need to see you that day.